Also known as Wedding Entertainment NI, Wedding Entertainment Products & Wedding Entertainment UK. Congratulations on your engagement. You have landed on this page because of either yourself or someone that you dearly love said yes to marriage! That's wonderful to hear. Now, of course, all we would like to know is which gorgeously hot honeymoon destination are you flying off to? (Jealous). Before you start flicking through glossy holiday magazines, you've got a celebration to organise. Let's get started. 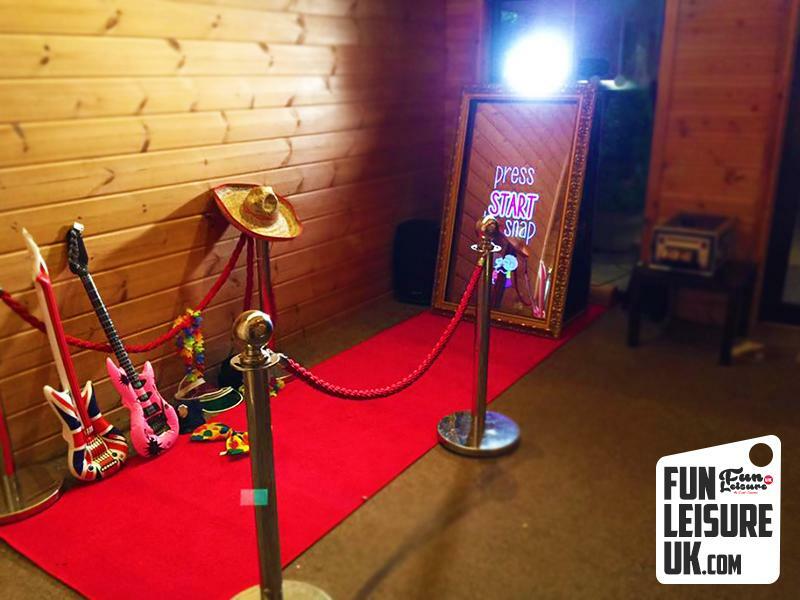 Here at Fun Leisure UK, we understand that your wedding is the most special day of your life, and we want to aid you through it with a stress-free planning experience. Start your wedding planning with tea, biscuits and a chat at our Showroom in Lancashire, from there our friendly coordinators can introduce you to the latest unique wedding products - Take a look to see how they can benefit you and your guests. Couples are always seeking exceptional fun wedding products to make their day stand right out from the rest; we have a variety of choice to fit everyone's wedding theme. The best in special effects and pyrotechnics. Think the first dance at a wedding or the entrance of an act or band. Very versatile confetti cannon units for creating magical moments. 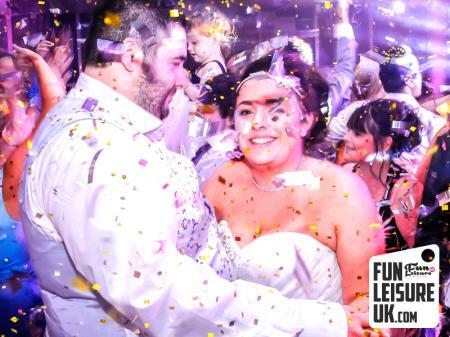 We have a large range of different types of confetti; from plain white to multicoloured even metallic looking and glitter, which can often be combined to provide a jaw-dropping effect. Gather your friends and family together and let them experience something like no other. A perfect ice-breaker for all ages to enjoy at your wedding. Imagine a fun product that can bring miserable Uncle Bob and quiet Cousin Smithy together. Keep your guests entertained for hours. 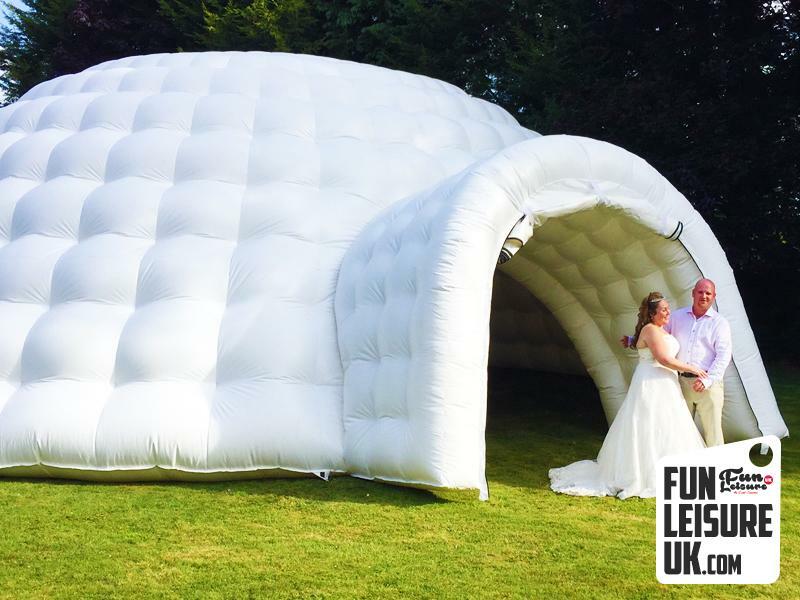 Igloo Discos are perfect alternatives to an event marquee hire; inflatable venues are unique pop-up structures for your upcoming wedding. Jaw dropping, exclusive and eye-catching are a few common descriptive words used to describe our Igloo Discos. Available in 12 and 16.5M configurations it had endless possibilities to cater for your guests.